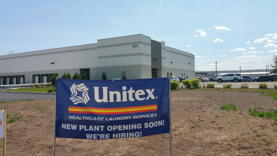 Linden, NJ, May 2016— Unitex, a regional healthcare laundry company with locations throughout the Northeast, is opening its 12th facility at 301 Pleasant Street in Linden, N.J. This will be the fourth facility the company owns and operates in the state of New Jersey, with existing facilities in Perth Amboy and New Brunswick. The Linden plant will officially open in June and is currently taking applications to fill its 200+ positions. With jobs ranging from production workers to mechanics and drivers, the Linden facility will provide over 200 full-time employees with a challenging, fast-paced, and rewarding work environment in which they can develop themselves and their co-workers to a greater level of potential. As a leader in the healthcare laundry industry, the team at Unitex is always looking at new green practices to run their plants more efficiently and cost effectively while benefiting the planet. The green technology being utilized at each plant is the key to innovating in the marketplace and growing even larger in the Northeast region and beyond. To that end, the company is continually looking at news ways to help improve the carbon footprint by efficiently using energy, implementing state-of-the-art equipment and resourceful procedures and reusing and recycling material regularly. It is crucial for the team to make environmental stewardship a priority always, and the 67,000+ sq. ft. Linden plant is following that direction. In fact, the Linden facility is comprised of the most advanced laundry and linen processing systems in the world. The Linden facility has the capability to process 1.1 million pounds of linen per week, and will primarily serve hospitals and nursing homes in N.J. and N.Y. 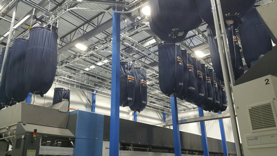 Inside this new state of the art processing facility, you can see huge slings holding more than 200 pounds of laundry each, while workers busily sort thousands of pounds of linens. Alongside this process, automatic machinery that moves and sorts the linens through the plant feed washing machines that are each capable of washing over 7,000 pounds of laundry an hour, utilizing the most energy efficient technology available.